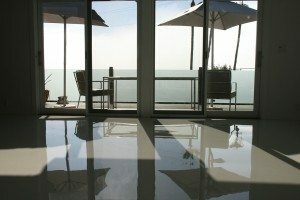 It can be tough to find a floor solution that stands the test of time whole being chemical, spills and stain resistant. Almost every type of flooring has some disadvantage or the other. And that’s one of the reasons as to why having stable shoes for walking on concrete is very important. An excellent choice for a variety of needs, epoxy floors seem to have fewer drawbacks and more benefits. However, examining both pros and cons of this material is a good idea if you’re considering installing it at home or work. Compared to an average garage floor, epoxy floors are bright and professional. Their appearance alone makes them enticing to use. The smooth and even surface is also very easy to sweep and maintain. Since not much sticks to this type of flooring, cleaning up a mess a very easy. Compared to other types of flooring, the per square foot cost of epoxy floors are tough to beat. Since it can be installed directly over concrete and other flooring types, the installation costs are quite a bit lower than the others. Pricing remains one of the biggest and the most immediate advantages you’ll find with epoxy flooring. Distinctly valued for their durability, epoxy floors have a longer lifespan than many other floor types. Concrete is the only material that beats it, but it needs to be properly sealed and maintained. Besides, an epoxy floor coating required concrete beneath it anyway. Epoxy floor coating makes renders concrete exceptionally durable. They also offer benefits of anti-fatigue and can be easily rolled-out on the cement without mortar or glue. Epoxy is a great choice to decorate your floors as well. It’s available in a variety of colors that add a flawless, smooth, elegant shine elegant shine. The flooring can also be arranged into traditional or personalized patterns and designs. The number of choices makes it an economical way to upgrade plain concrete and improve the ambience of a home or office. One of the lesser-known advantages of using epoxy on a garage floor is it enhances visibility inside the garage by reflecting light off the floor. One of the major disadvantages of using epoxy on your floors is that it’s a temporary flooring solution. Though durable and resistant, you will have to replace it eventually. Unlike some other flooring solutions, everyday wear and tear takes it toll on epoxy floors. To keep things looking good, you’ll have to put down a new coat of epoxy. This is inevitable especially if heavy things are dropped on the surface of the floor. Cracks can develop and chipping is a very common issue. Thought chips can start out as a small annoyance, eventually they can lead to a large area of the coat peeling off of the floor. Wheeled carts and toolbox wheels also get caught catch as they are rolled over the damaged spot. The floor has to be repaired when this happens. Epoxy floors are relatively skid resistant. This con is not universal. It’s specific only to oil-covered epoxy since that can be very slippery. But, they can also become very slippery when wet, which creates a dangerous situation. They are not a good choice in areas that may be prone to spills or water on the floor. This is another drawback. However, you can mitigate this risk, at least to some degree, if you’re able to texturize your floor. Getting the existing floors ready for applying epoxy is tedious. A significant amount of effort goes into it to. The concrete floor has to be clean and free of any grease, oil, or solvents before the epoxy coating is applied. Cracks will need to be filled as well. Cleaning concrete floors requires multiple attempts. All this preparation work required is a drawback. The good news is that with the advancements in the manufacture and application methods, homeowners will find it relatively easy to apply using hand tools in a minimum amount of time. Apart from the extensive preparation that goes into getting the concrete ready, applying the epoxy coating is a time consuming process. It also takes several days to dry properly. Additionally, the first coat of epoxy must dry completely before adding the next coat. Epoxy flooring needs to be installed exactly according to directions. If not done properly, the flooring will not last as long as it should. The coating also gets scratched pretty easily. It’s very hard to clean paint overspray off of it. The coating should be applied only when during that time of the year when the humidity levels are low. This is because moisture can affect the durability of these floors. The concrete floor must be dried, prepared and cleaned thoroughly before applying epoxy to avoid adherence issues. Epoxy does not adhere well in a moist environment such as a basement. The epoxy paint peels off the floors if applied in a damp environment on a moist floor. Since the material doesn’t breathe once it cures, any moisture trapped below the surface can be a problem as it evaporates. It may lead to the eventual need for repair or refinishing as bubbling or buckling in the flooring material may occur in some cases. Homeowners have to buy special cleaning acids and other chemicals to ensure that the epoxy sticks. It’s also necessary to buy and use special protective clothing, protective eyewear and breathing devices when using these chemicals. Not only does this increase the amount of time and effort necessary, but in some instance, it can also increase costs. Once the epoxy is applied, changing colors or designs can be a labor-intensive and costly endeavor. In those situations where the floor has to be repaired, removing the coating is quite extensive and difficult. There are several pros and cons to using epoxy floors. It’s highly recommended that you consult a professional contractor to conduct an analysis of your floor before making any decision. A professional can also evaluate the moisture tolerance of the floor to minimize the chances of delamination.